I grew up in a small town in South Central Ohio where the pumpkin is king. Once a year, the downtown area transforms into a carnival that takes up the entire downtown. There, you can find everything pumpkin related; from a pumpkin pie that is 8 foot in diameter to pumpkin burgers, pumpkin fudge, pumpkin doughnuts and even pumpkin chili. Needless to say, I adore pumpkin spice recipes! 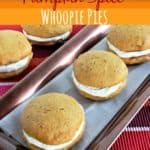 If you, like me, love the taste of delicious pumpkin spice recipes, you will love this recipe for Pumpkin Spice Whoopie Pies. It’s right up there with my “famous” pumpkin roll recipe! 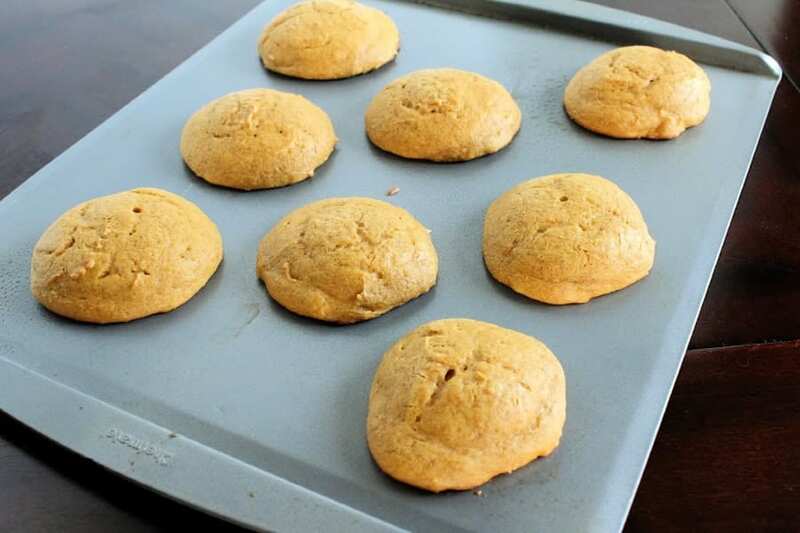 These pumpkin spice whoopie pies are super simple to make, but taste like they took hours. If you can make a boxed cake mix, you can absolutely make these. In fact, they use a boxed cake mix! No one will ever know though. They taste like you spent hours on them! They keep a few days in the fridge too so they’re perfect for gifting to anyone who loves pumpkin spice recipes. I like to make them a day or two before Thanksgiving since they make a great dessert to get everyone in the Thanksgiving mood. The real win for this pumpkin spice whoopie pies recipe and what makes it one of my favorite pumpkin spice recipes is that it is super quick to make! You can have a batch sitting on a cooling rack in just a few minutes! If you want these pumpkin spice whoopie pies to taste the best they can, be sure to use room temperature eggs. Anytime you bake, you should always use room temperature eggs unless your recipe specifies otherwise. To start, preheat your oven to 350˚and grease a large cookie sheet. Set the sheet aside for later. Combine the cake mix, pudding, canned pumpkin, 1 ½ tsp Cinnamon, Ginger, ½ tsp Nutmeg, oil, eggs and water in a large mixing bowl. There is no specific order that you need to mix them in so toss the ingredients into the bowl and move on. Next, mix the ingredients until they’re fully combined. I prefer to use a rubber spatula to do this by hand, but you can use a hand mixer if you prefer. I find it relaxing to bake and cook by hand, but it shouldn’t hurt anything to do it with the mixer. 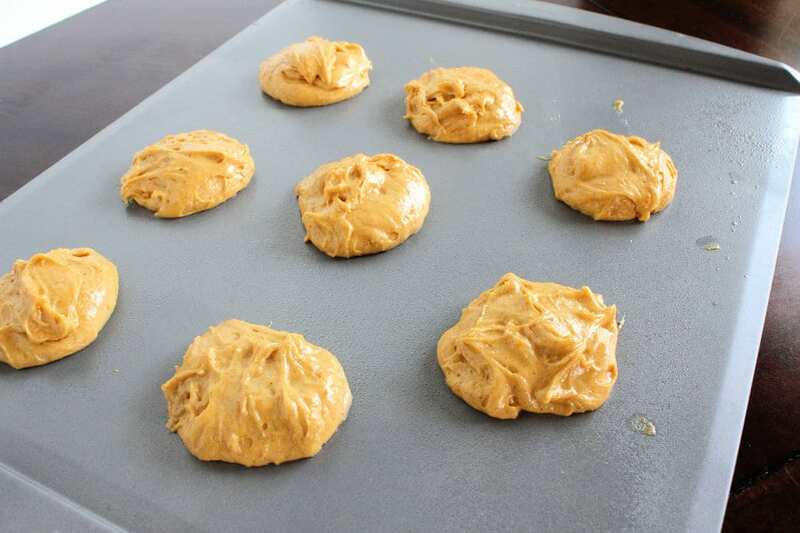 Spoon out the batter onto a greased cookie sheet. I personally use THESE cookie sheets because they don’t stick nearly as much as others that I have tried. Whenever I make these, I typically use a heaping tablespoon measure. I don’t measure too much and simply put whatever I scoop up on the sheet. 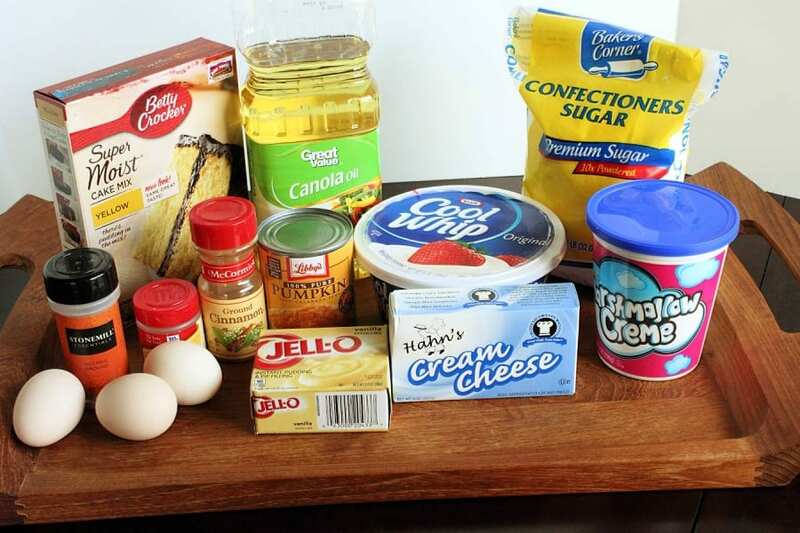 It is around 4 tablespoons for each cake. This made huge pies and some leftover filling. You could cut that in half to 2 tablespoons and double the number of pies you get if you prefer smaller ones. We like them larger though so I’ve kept these measurements. Bake at 350˚ until a tooth pick inserted in the middle comes out clean. Remove from the oven and let cool for several minutes before removing them with a firm spatula to a cooling rack. While the cakes are cooling, make the filling by combining the cream cheese, remaining cinnamon, remaining nutmeg and the marshmallow creme into a second large mixing bowl. Mix just until it’s smooth and then gently fold in the whipped topping making sure it’s all combined well. Don’t over stir this mixture. It’s supposed to be light and fluffy and over mixing can cause it to stiffen up. It is best to use a rubber spatula for this part since a spoon can cause it to have ingredients that are left unmixed. Once your cakes are cool, it’s time to fill them. Turn one cake so that the flat side is facing up and use a spoon or piping bag to cover the cake. The filling should be about as thick as the cake so that you get equal tastes instead of all cake and no filling. I used a piping bag with a star tip to fill mine. I started in the middle of the cake then worked my way to the edge in a spiral motion. I also put a little extra in the middle for the top cake to help hold the second cake up without squishing down the filling too much. Top with another cake flat side down. At this point you can sprinkle powdered sugar on top if you want, but you don’t have to. I usually don’t because I find it makes them too sweet for our taste buds. Store your pumpkin spice whoopie pies in an airtight container in the fridge. If you layer them in the food storage container, be sure to use wax paper or parchment paper in between each layer to help keep them from sticking to each other. 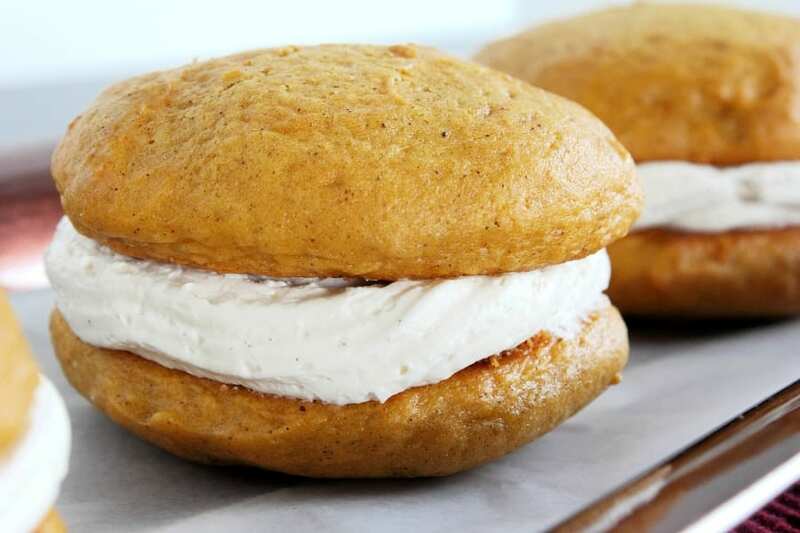 Pumpkin season is here and these Pumpkin Spice Whoopie Pies are calling! They're the perfect pumpkin dessert to tame your craving! 1 Pkg. Vanilla Instant Pudding 3.4 oz. 1 Can Pumpkin 8 oz. 1 Pkg. Marshmallow Crème 7 oz. 1 Tub Whipped Topping 8 oz. 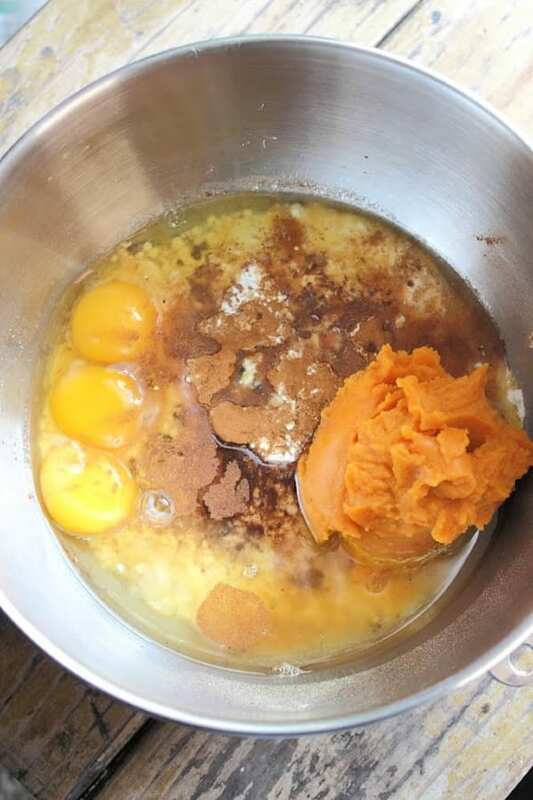 Preheat your oven to 350˚ then combine the Cake Mix, Pudding, Pumpkin, 1 ½ tsp Cinnamon, Ginger, ½ tsp Nutmeg, Oil, Eggs and water in a large mixing bowl. Stir well and mix until well blended. 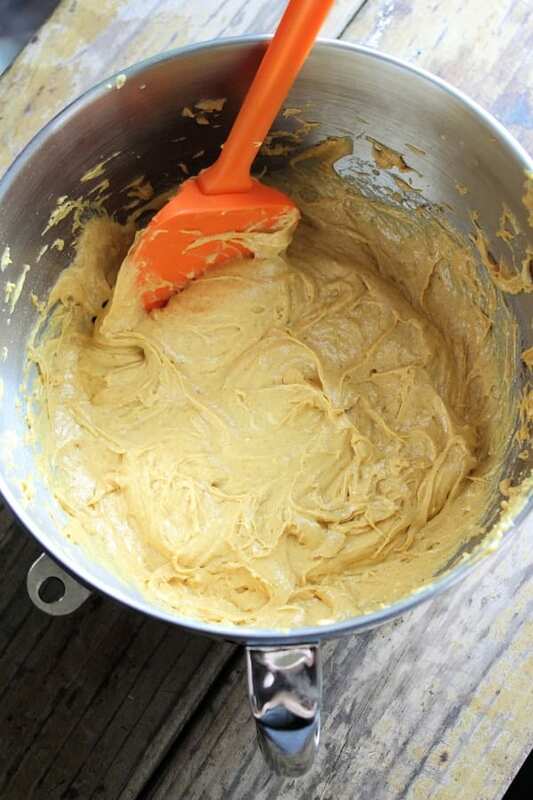 Spoon out the batter onto a greased cookie sheet. Bake at 350˚ until a tooth pick inserted in the middle comes out clean. In another large mixing bowl, mix together the Cream Cheese, the remaining cinnamon and nutmeg and the marshmallow crème. Mix until it’s smooth and then gently fold in the whipped topping making sure it’s all combined well. Once your cakes are cool, it’s time to fill them. Turn one cake so that the flat side is facing up and use a spoon or piping bag to cover the cake. The filling should be about as thick as the cake.